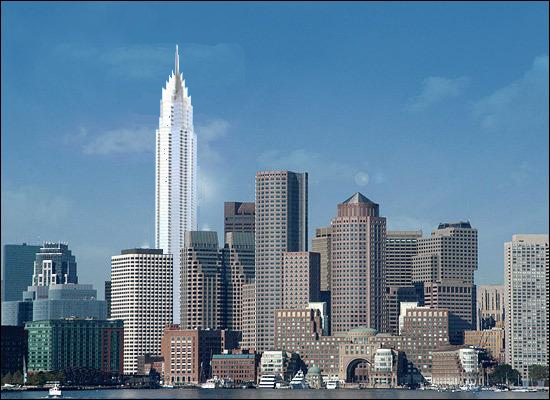 ^ maybe we dont need a supertall after all? That tower has a disgusting ground level. The base would single handedly destroy our city's fabric and street life. We should totally build that in the West End. Last edited by vanshnookenraggen; 05-22-2012 at 10:16 AM. Do any supertalls actually have a good (pro-urban) ground level? 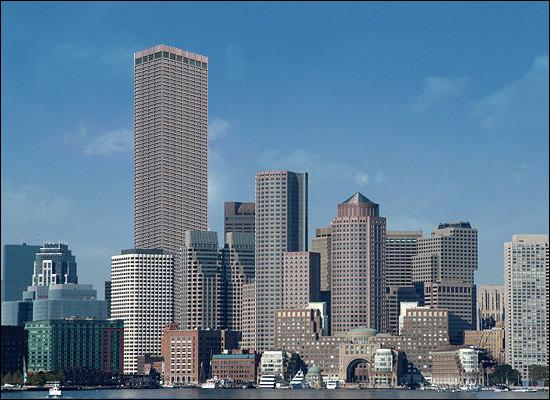 People are always complaining about how Boston has no supertalls, but they also complain about office towers with massive corporate lobbies or malls at the base. It's almost a given that a supertall will have these features, so why would you even want one? I think the constituency on this forum that prizes supertalls ueber alles doesn't necessarily overlap entirely with the one that prioritizes ground level activity. That said, even thirty-story buildings usually have a lot of ground floor lobby space. You just need to have enough for check-in, security, elevator banks, etc. Wonder if you'd be able to see the Empire State Building from the top? 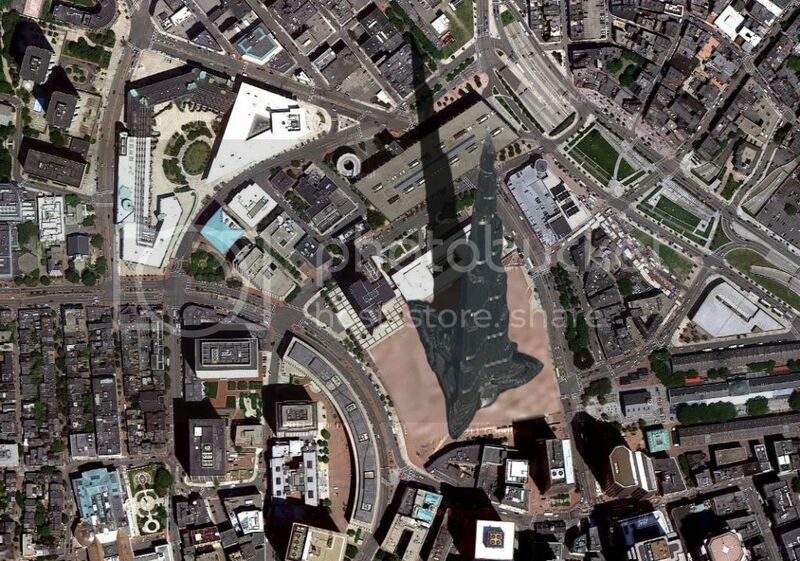 Someone quick, GoogleEarth the view at that altitude from downtown. Both are at the same scale (or as close as possible). Alright, I'll bite, I'd much rather have that than the Suffolk Probate and Family Court building, which has about the same footprint and is probably worse for street level interaction. If I could be greedy I'd still like a couple of other towers to help contextualize it in the skyline. ...In the wake of destalinization the dedication to Stalin was revoked; Stalin's name was removed from the interior lobby and one of the building's sculptures. Currently it is the 187th tallest building in the world. The inhabitants of Warsaw still commonly use nicknames to refer to the palace, notably Pekin (Beijing in Polish, because of its abbreviated name PKiN (Pałac Kultury i Nauki), Pajac ("clown", a word that sounds close to Pałac), Stalin's syringe, the Elephant in Lacy Underwear, or even the Russian Wedding Cake. The terrace on the 30th floor, at 114 metres, is a well-known tourist attraction with a panoramic view of the city. The building currently serves as an exhibition center and office complex. 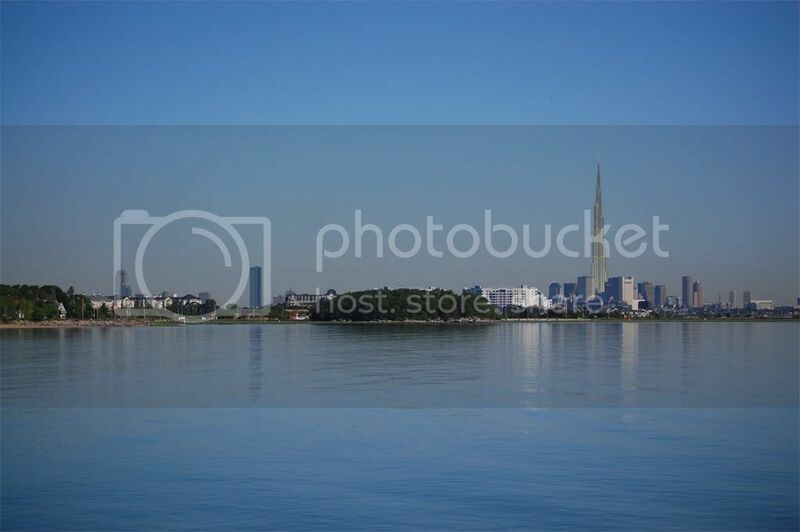 It is 231 metres (757 ft) tall which includes the height of the spire of 43 meters. There are 3288 rooms on 42 floors, with an overall area of 123,000 m², containing cinemas, theatres, museums, offices, bookshops, a large conference hall for 3000 people, and an accredited university, Collegium Civitas on the 11th and 12th floors of the building. The palace's surrounding is still much less attractive then the building itself. Maybe apart from the area north of the building, where a park is located. But the areas south and east of the building are still undeveloped spaces. Car parks scattered in chaotic way, primitive stalls and enormous, metal market halls are elements of this area's landscape. Most of Warsaw inhabitants feel embarrassed that they have such city centre. Since many years architect and city authorities are thinking how to develop this area, but still in practise nothing is going on. There was a lot of different contests an conceptions of the palace's surrounding development. In 1998 there was a project of constructing around the palace skyscrapers in the shape of a crown. 5 versions of this conception were prepared but all of them were rejected so actually the case came back to where it started from. Then another ideas appeared. One of them was to construct in the place of today's Museum of Technology (southern part of the palace) a large, 340-metre-high, obelisk-shaped skyscraper, which would house among others 'Museum of Communism'. But also that project were declined and authors of 'Museum of Communism' idea, Jacek Fedorowicz and Andrzej Wajda will probably choose a different localisation for its realisation. There were also other ideas, some of them very original, like for example painting all the building in the colours of rainbow, constructing a metal tower next to the building or cutting it into pieces and putting each of them separately. Perhaps the most amazing one was the project of surrounding the whole building with an enormous dome, so that the palace did not spoil the city's landscape but also that it was not destructed. It is a shame that none of those untypical ideas were realised. The palace altered in such extraordinary way would attract tourists from all of the world for sure. On the beginning of 2006, after turbulent discussions, master plan of the palace's surrounding was finally passed. But it provides boring and mundane solutions, not appropriate for big European capital city. It is just a project of building-up the area with typical, not very high houses and creating a few squares for public events. There is no fantasy or originality in this project. Why the city authorities do not have enough courage to support some of those untypical or even crazy ideas of Defilad Square development ? We should not be afraid of changing really a lot around the Palace of Culture ! Even the idea of the building's knockdown should not be neglected completely. Warsaw is a city that is built-up in such chaotic way that no attempts of putting it into order by introducing balanced buildings in the Centre will succeed. The pre-war city's character will not be reconstructed anyway. Buildings that are untypical, controversial but also interesting because of that are now our chance. Unfortunately, neither any from the past city authorities, none the present one does not have enough courage to make such radical decisions. All that we can do is to hope that the master plan that is currently valid would not be realised also and that a different one, better and having more social support will be worked out soon. And that it will be put into life finally. Maybe in few years time we will have a real European city centre finally. In 2007 Palace of Culture was listed in the register of historical buildings. So that actually means that its presence in urban landscape was finally accepted and any ideas of its demolition can no longer exist. History of PKiN in a nutshell. 1. The highest building in , 42 floors. Viewing Platform on the 30th floor at the altitude of 114 m.
2. There are 3288 rooms in the Palace. 4. Joseph Stalin is the author of the concept. 5. Architect L. W. Rudniew wants the sky-scraper to incarnate features of the Polish national style. In order to do this he tours well-known Polish cities and towns like Kraków, Chełm, Zamość finding out about Polish architecture. 6. Rudniew and his team are a steam engine of projects. The Polish select a 120 m building design, since their ambition exceeds that level it results in building much bigger edifice. 7. 3,500 Russian workers are employed at the construction site. There is a housing estate built for them together with facilities like: cinema, cafeteria, public club and swimming pool. 8. There are 16 fatal accidents among Russians working at the construction. The year of 1956 starts a series of suicidal jumps from the sightseeing terrace on the 30 storey initiated by a French man. Seven Poles follow him. Those incidents cause installation of metal grid on the sightseeing terrace. 9. On the New Year’s Eve of 2000 the biggest tower clock is unveiled on top of the Palace of Culture, its 4 dials are of 6 m long diameter each. 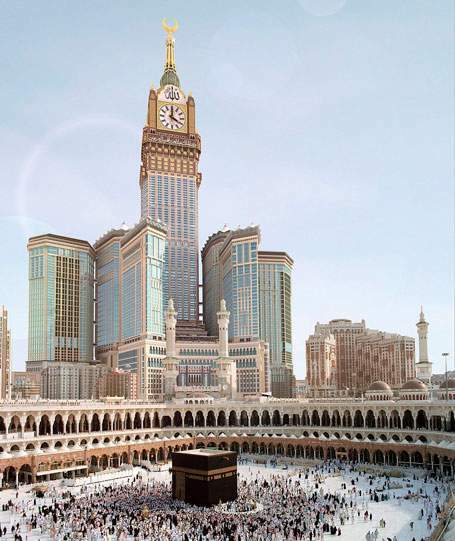 This Millenium Clock becomes also the highest tower clock in the world. So after all that blah blah, the answer is no. It doesn't engage the street at all. The damn thing is surrounded by parking lots. It's just a typical Soviet wedding cake. Sheesh, the last thing this town needs is Da Mayuh ruling over us from Isengard. Last edited by kz1000ps; 05-23-2012 at 11:34 AM.